Dental fillings are used to repair an area of damage or decay within a tooth. At ConfiDenT, we proudly offer the most proven and preferred filling material available. Our tooth-colored fillings provide a seamless blend within your natural smile while rebuilding the integrity and strength of the tooth for years to come. 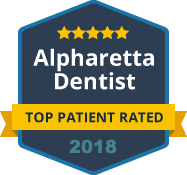 Our Alpharetta practice is equipped to treat patients with a full menu of dental services throughout all stages of life. We value the importance a patient-centered approach to modern dental care. White composite fillings are recognized as a more favorable alternative to past silver (amalgam) fillings. Due to their natural aesthetics, improved durability and better long-term safety, composite fillings are preferred for both dentist and patient alike. While they can effectively repair an area of decay within a tooth, this filling material can also be used to make cosmetic improvements within your smile. Many patients benefit from composite resin’s ability to fill in a minor tooth gap, reverse a stubborn stain or repair a small chip. ConfiDenT is proud to offer tooth-colored fillings as an unrivaled treatment option in restorative and cosmetic dentistry. Composite resin is a white plastic and glass mixture that can be customized in color, shape and form. Due to its aesthetic appeal, composite resin is an ideal filling choice for both the back teeth and front teeth, as all teeth are susceptible to cavities. Composite resin is gently applied in layers to the affected tooth. It is then hardened under a special curing light and custom shaped, smoothed and polished for superior results. Composite resin bonds directly to the tooth to make it stronger and more protected against future damage. At ConfiDenT, filling procedures can be completed within minutes. You can trust that we will take extra measures to keep you informed and comfortable during your visit. To learn more about how composite, tooth-colored fillings can restore your smile, contact ConfiDenT in Alpharetta. When it comes to repairing your teeth, we pursue excellence at every step.